Did you know that the seemingly innocent act of texting your client might be part of their clinical record, and if not handled properly...your career is at risk. Should I add my client on Facebook? Is it safe to see my client via Skype? Is my client's Electronic Medical Record secure? If you're unsure of the answers to any of these questions, your practice may be in jeopardy. The key to keeping yourself, your clients, and your mental health practice safe, is educating yourself on the new laws regarding technology in and outside of the therapy room. In this NEW, intensive online course, we're going to show you how you can safely and effectively use technology to engage with your clients, enhance the services you offer, and most importantly, protect your client's confidentiality and privacy. Register today and save over 50%! SPECIAL BONUS: Act now and you can complete required state-specific Ethics training and CE credits absolutely FREE (A $199.99 value)! *Earn your required Ethics CE Hours — included in today's deeply discounted price! Special Bonus! Register now and you can complete your required state-specific CE seminar and credits absolutely FREE! 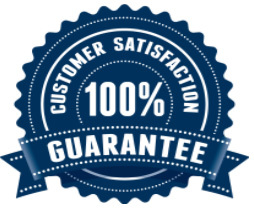 Click here for Credit Information. Enroll today and you'll also get these amazing FREE BONUSES! PDF Book Download | Legal and Ethical Issues for Mental Health Clinicians: Best Practices for Avoiding Litigation, Complaints and Malpractice...A $19.99 Value — Yours FREE! By Susan J. Lewis, Ph.D., J.D. This go-to resource goes beyond the what and why, focusing on how to protect you and your clients in an increasingly litigious society. Get practical guidance, strategies, solutions and up-to-date information to help keep you out of court and jail. Is your Ethics deadline looming? Earn your REQUIRED state-specific CE Hours with these bonus videos...A $199.99 value per state — Yours FREE when you sign up now. Register today and you'll get instant access to all 47 state-specific ethics courses and CE Hours! *Please note: Not all boards allow ethics credit for self-study products. Your state licensing board dictates whether self-study is an acceptable form of continuing education. If ethics is not specified within your licensing board's approval statement above, please refer to your state rules and regulations by contacting your board to determine the applicability and amount of ethics allowed. View all state-specific seminar speaker information here. Joni Gilbertson, MA, NCC, LCPC, is a licensed clinical professional counselor, court program specialist and credentialed distance counselor. She is licensed in Illinois and presently resides in Florida. Joni is also a college instructor in the Sociology Department where she teaches legal issues and numerous other mental health and criminal justice classes. She recently was nominated and presented with the award for “Teachers Who Make a Difference” due to her engaging and dynamic style of teaching. Speaker Disclosures: Financial: Joni Gilbertson is owner of COPE Counseling Services. She receives a speaking honorarium from PESI, Inc. Non-financial: Joni Gilbertson has no relevant non-financial relationship to disclose. Watch your email for your order confirmation, and get instant access to the comprehensive course materials. Review all the course materials at your own pace and at your convenience! Click here for course objectives and outline. Instantly collaborate with other professionals on the course materials through interactive message boards. You'll be part of a community of hundreds of practitioners all focused on legal and ethical issues in mental health. 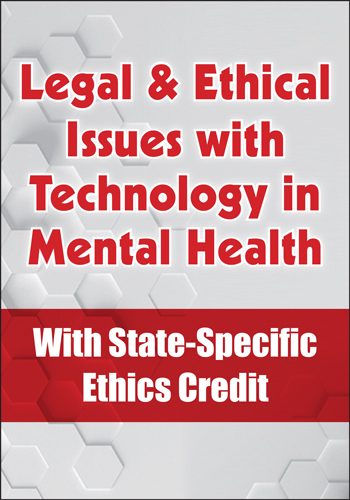 Complete your online CE tests and earn up to 6 CE Hours for Legal and Ethical Issues with Technology in Mental Health (Click here for total course CE Credit), plus earn up to an additional 6 CE hours per state-specific CE seminar (*see above for CE details specific to your state).